Classic cotton denim defines a versatile jacket built for on-point street style. Style Name: Madewell Classic Denim Jacket. Style Number: 5679886. Available in stores. The classic denim jacket that everyone should have! 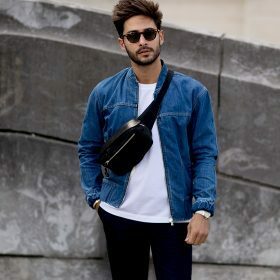 Denim jackets work with any outfit whether youre going denim on denim or you are pairing it with some trousers. Denim jackets have the ability to make any outfit look trendy and casual! With different designs and styles there is something for everyone. If you want them in colour, denim jackets now come in a range of colours like pink, black and white. The designs are also endless with distressed designs or designs with patterns on them. Know exactly what you're looking for? Use our search filters to narrow down your search by size, colour, brand, shop, and material. Just browsing around? Try out our other categories like men's leather jackets.